So there I was, back in the nineties, in the middle of the “cigar boom”. I had just been married and had a job fit for a man’s man. Conditions were ripe for me to spend plenty of time at the smoke shop. On my days off from my job as a R&D mechanic for large equipment manufacturer in central Florida, I would spend 8 to 10 hours at my local brick and mortar. Between sampling the newest double corona or robust maduro, I would glance over the selection of pipes and tobaccos. Occasionally someone would walk in with a lit pipe and I would catch a whiff. It smelled great, of course, as one would expect a heavy vanilla or cherry blend to. Now, my uncle smoked pipes for as long as I could remember. 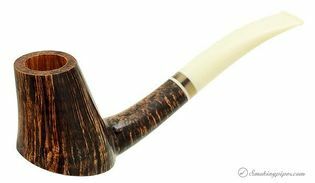 The smell of someone’s pipe in the shop reminded me of my visits to my uncle’s house and the unmistakable aroma of his Prince Albert and Dr. Grabow. I had succumbed to the enticement of the odor and bought a basket pipe and a house blend. It was all downhill from there. I decided that I would make some nice extravagant pipes for myself! My local shop carried four or five pipe making kits. They consisted of a pre-drilled ebuchon with a stem stuck in it. I bought one for fourteen dollars and went to work, inspired by those pipe artists I had seen online, not for their shapes, but for the originality and imagination of their designs. 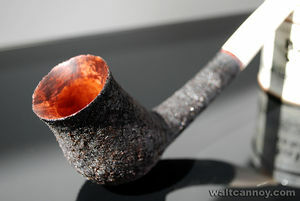 After a week of chewing away wood with rasps and files and sanding until my hands went numb, I had a finished pipe. The grain was unimpressive, then, what did I know about grain, and the shape was, well, unique. But most importantly, I had made my first pipe. After a couple of years of making pipes for myself, and a few for friends, I noticed that the quality and artistry was improving drastically. 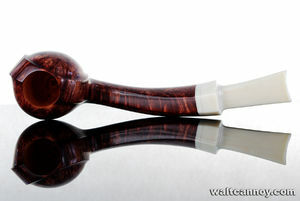 I had made some pipes which I was so proud of that I wanted to take pictures of them. My wife was taking photography classes at the local community college so we decided to take them to the school and snap some glamour shots in briar. Now, her photography instructor was also an avid eBay-er. He suggested that I try to sell some of them on eBay. In 1999 I sold my first pipe, on eBay. I think I started it out at one cent. I do recall that the winning bid was over a hundred dollars. I had found a new business opportunity doing something that I really liked to do! Word seemed to spread quickly about my pipes. 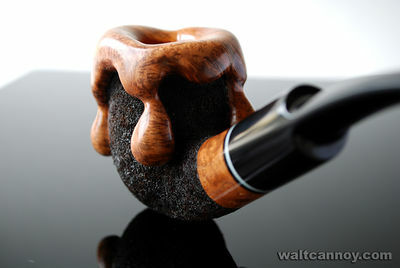 I attended the South Florida Briar Brotherhood pipe show in 2000. I was greeted with enthusiasm and eagerness to see my new works. A couple of years, shows, articles, and awards later, I was a full time pipe maker with a website, retailers, and a thriving business. Then in 2003, my work slowed to a crawl when I had nerve damage in my spine. The pain was incredible and kept me away from the shop most of the time. I got way behind in my work and bills started piling up. Finally, in October of the same year, a local neurosurgeon cut open my spine and removed pieces of a ruptured disc. I started making a recovery, although the doctor bills worsened my financial state. My marriage was starting to feel the strain of the crippled finances. I hope to see all of my old friends at pipe shows and club meetings very soon! 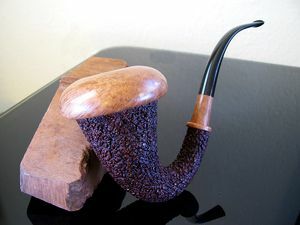 I use briar from a couple of different regions. 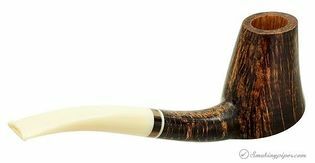 Briar from one source might be more suitable for highly detailed sandblasts, while briar from another source tends to yield more well grained smooth pipes. Some of my briar is ordered in bulk, while some is hand picked by myself from the cutter. 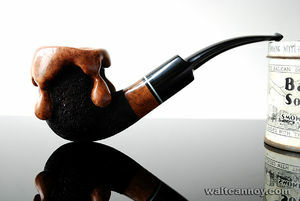 Wherever the origin, all of my briar undergoes a thorough and quite effective curing process including aging of the wood before it is worked, and special processes during the creation of the pipe to help remove and neutralize any excess tannins, acids, and resins that might be left in the briar. I tend to work on only one pipe at a time, from start to finish, to ensure that each pipe commands my full attention. There have been exceptions to this practice, but only in rare occasions. 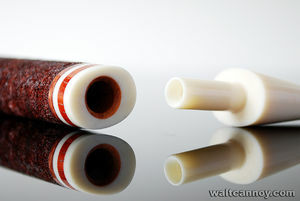 Each pipe is unique in shape and dimensions. Even the few standard shaped pipes that I make are unique, as I do not use templates or predetermined sizes in the creation of the pipe. Each pipe is shaped entirely by hand and measured and proportioned only by my eyes. This is a one-man process. Every step involved in the crafting of a Cannoy pipe is done solely by me. Most of my tobacco chambers are tapered toward the bottom. This is sometimes referred to as a conical bowl. In the rare instance that I should produce a billiard or a pot or the like, I will use a cylindrical tobacco chamber. Of course, the special drill bits to bore the chambers were ground to my own preferences... by me. The tobacco chambers are hand sanded to minimize the risk of burn out due to rough edges inside the bowl. 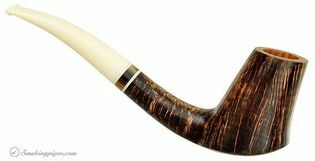 The smoke hole of a Cannoy pipe is quite open from the bottom of the tobacco chamber to the end of the stem. The end of the tennon and the bottom of the mortise is funneled using special tools to ensure a dry, full flavored smoke. 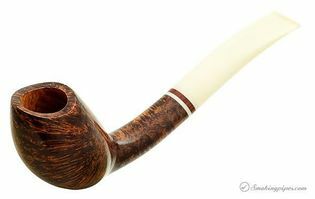 The draught hole must enter the tobacco chamber at the exact bottom center, or the pipe cannot receive the Cannoy stamp. Also, each completed pipe must be able to pass a pipe cleaner from the button of the stem to the bottom of the tobacco chamber without requiring disassembly. 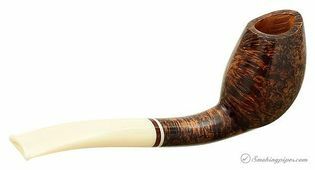 There might be rare exceptions to this in the case of a full bent or an extreme creation, and this would be noted in the description of the pipe. I take great pride in the fact that every pipe I make is made, above all else, as an instrument designed to deliver a superior smoking experience, regardless of looks. My stems are hand-cut from fine German vulcanite and Cumberland rod. I use these almost exclusively. 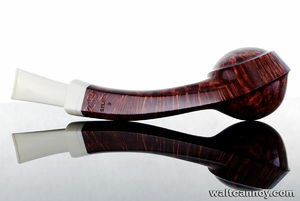 If I use some other material, it will be noted in the description of the pipe. The stem is opened up at the button end to further ensure a more brilliant flavor. The pipes are finished with alcohol-based stains to eliminate any possibility of residual flavor or odor from the coloring process. The stains are mixed from basic colors of powdered stain one small batch at a time, until it "looks about right". 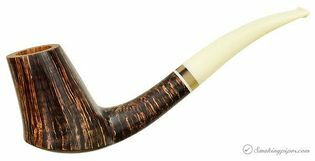 The finished pipe is coated with only pure carnauba wax. 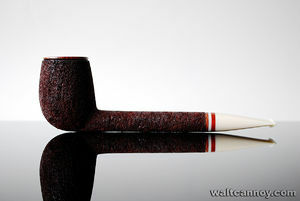 Each pipe is stamped with "W CANNOY", a serial number, and a grade. 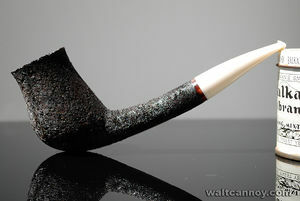 I never complete more than one pipe in a given day, so the serial number denotes the date of completion for the pipe. This page was last edited on 19 May 2017, at 13:05.